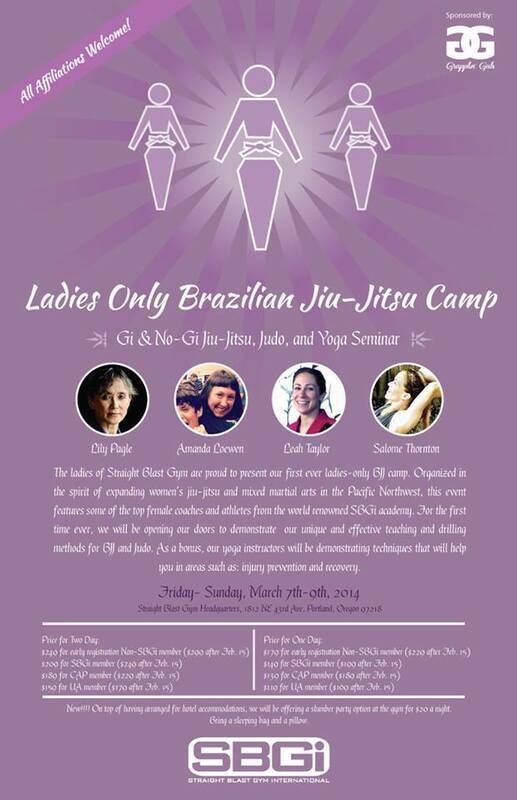 The first West coast women only BJJ camp of 2014 is scheduled for March 7-9th at SBGi Portland gym, and we asked the organizer, Salome Thornton, to talk a little bit about Straight Blast Gym International (SBGi), and the upcoming event. 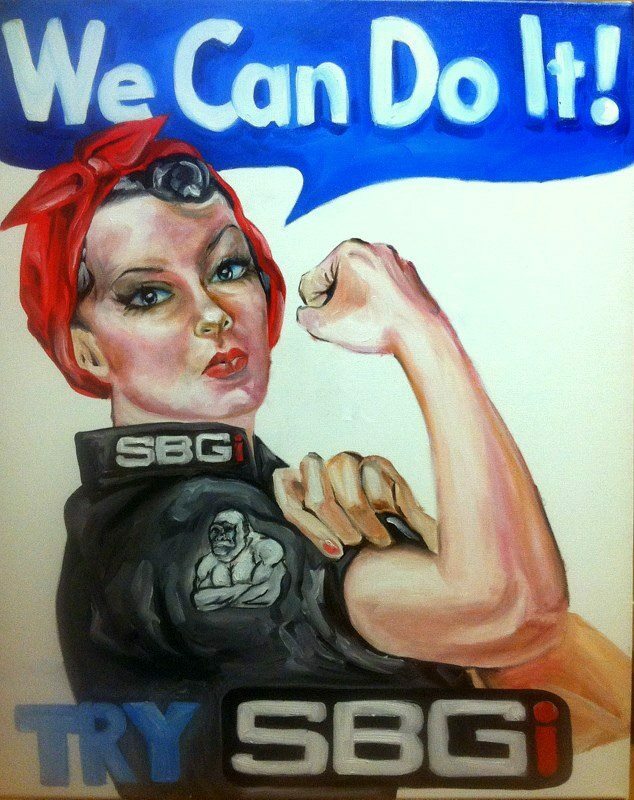 Salome: SBGi is an international organization with gyms all over America, Europe and Asia. We have decades of experience running camps that are educational, interactive and inspiring. For a very long time these camps consisted mostly of men, because gyms were filled with men. We are known for teaching BJJ using the I-Method, which consists of introduction, isolation and integration. It is a three stage process that begins with introduction stage, learning the movement, and posturing or pressuring properly. The student then proceeds to the isolation stage where that skill is applied against progressive resistance from a partner so that the crucial element of timing is included. It finishes with the integration stage, where the part is brought back into the whole context of whatever we are training for. Introduction, isolation, and integration are usually all within the same practice session. Starting a women’s BJJ camp was something that became an interest to us about a year ago after last year’s spring camp. Fairly recently we tweaked a few of our teaching methods to help students learn better and faster. It did amazing things to for our female student population. The number of women grew quickly from one girl in the mists of testosterone to at least 30% of women on the mat at any given time. As the number of women on the mat grew, we realized how profound impact BJJ, and the friendships that came along with it had on their lives, and on our social culture. We want to grow this group of strong, and fearless females. This camp is open to all women no matter what gym they belong to. It is about bringing women all over the world together to share their love of BJJ, get a chance to train with each other, learn from female instructors, get to know each other, and above all enjoy the process! Our goal is to provide a comprehensive, well-rounded experience for everyone. We want girls to leave with their heads full of new, and immediately implementable information, a smile on their faces, and an inspiration to continue learning. The instructors for this camp are Lily Pagle, Amanda Loewen, Leah Taylor and myself. Lily Pagle is SBGi’s first female black belt, and USJF second degree judo black belt. She has a Master’s Degree in Counseling Psychology and is certified in sports psychology. Amanda Loewen, aka the Wizard, is one of SBGi’s top-notch brown belts, and homegrown coaches. She is a regular competitor, and her latest BJJ magic was shown off in her 64 minute round with a heavy weight black belt world champion Tammy Griego! Leah Taylor is also our homegrown SBGi brown belt, a coach and a competitive athlete. She is 2012 IBJJF blue belt world champion, and 2013 purple belt silver medalist. I am the founder of Primate Yoga ~ Practical Practice, and will be teaching yoga specifically for BJJ, giving girls a few helpful pointers on how to manage discomfort that often arises from rolling. I take a very practical approach to yoga, using the science of human anatomy, and the individual in front of me as a guide to help people improve their posture, and range of motion, help prevent, and rehabilitate injuries. We have one, two or three-day packages, and early bird prices available. To keep the lodging costs lower, we will have a slumber party/sleepover at the gym. Bring a pillow and a sleeping bag, and we will provide movies and popcorn! For more information please contact Straight Blast Gym Headquarters.